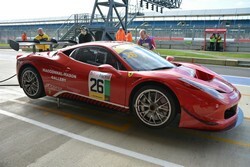 In line with the racing programme FF Corse have developed a range of aero kits for the F430 Challenge & 458. All the parts have been carefully developed and tested before being used in competition. All parts are fitted to our our race winning cars. The parts can all be supplied separately or fitted at our Silverstone workshop. We also have a large stock of new and used genuine Ferrari parts for the F430 & 360 Challenge at our Silverstone premises. For specific parts enquiries please email parts@ffcorse.com. The Evo update is addition to the original Aero 1 kit. The kit is supplied with a carbon front bonnet and revised ducting, modified carbon front fenders with ducts and a GT3 style rear diffuser. A fitting service is available. The FF Corse 2011 GT aero kit for the F430 Challenge comprises of full length font splitter, painted low reach replacement carbon-fibre bumper (with GT2 style infil), carbon wing aerfoil and support brackets. The kit includes all the required modified parts and fitting brackets.